When you are Super-Rich who can you Trust? Home | Books | When you are Super-Rich who can you Trust? 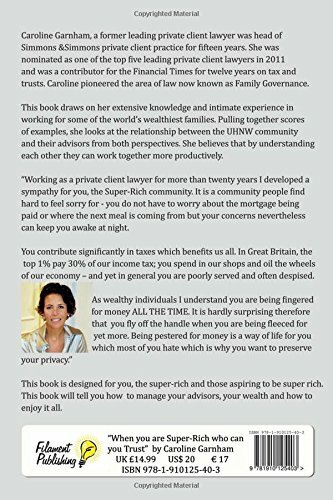 When you are Super-Rich is written by a private adviser for some of the world’s wealthiest families. 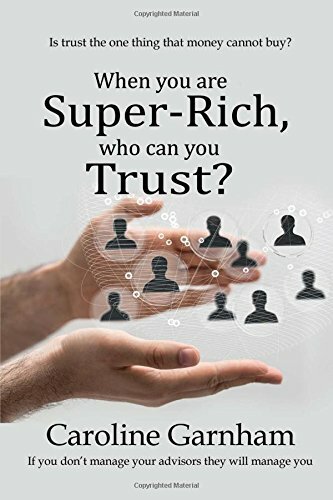 When you are Super-Rich, who can you trust? is an eight-step programme, which includes access to videos and questionnaires to help people make the most of their wealth. It also provides a unique insight into the life of the multi-millionaire/billionaire. “It is so often overlooked that the Super-Rich give most to our economy, and the lives of ordinary people through their entrepreneurial endeavours. But the rich are a minority, and of the few groups where prejudice flourishes. It is fair game to invade their privacy, expose their weaknesses and publish their private financial data,” says Caroline. Most Ultra High Net Worth (UHNW) individuals are self made and are looking for people to trust. The Super-Rich are human, just like you and me - but they have wealth burning a hole in their pocket about which they must make decisions every day. They need advisors, not least a bank for their money and an advisor to tell them what tax they need to pay. But, they struggle to find advisors they can trust. All have stories about being badly advised for substantial fees. The Book gives a rare insight into this community from whom so many want to win business, but about whom little is known - what keeps them awake at night, what do they worry about? By knowing what it is like to be rich, you can start to care for them and win business. Formerly head of the Private Client Group at Simmons and Simmons, Caroline Garnham has worked with numerous UHNW families and their family offices. She was awarded Top Five Hot Private Client Lawyers by The Lawyer in 2011, wrote as a contributor for the Financial Times on tax and trusts for twelve years, was a pioneer of family governance law and proposed and drafted the Executive Entity Act 2011 for the Bahamas. Caroline is passionate about connecting UHNW individuals with the advice they need in an easy to understand format and wants to encourage advisors to provide an exceptional service, thereby winning them new business. Books When you are Super-Rich, who can you Trust?